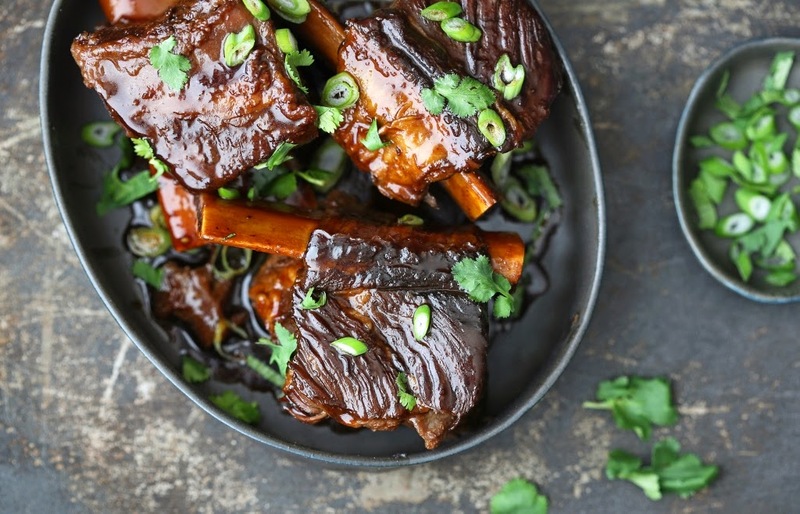 Asian braised short ribs that fall of the bone and infused with lemongrass, star anise, and cinnamon flavors. When I walking through the meat section at Whole Foods, I did a double take on the short ribs sitting in the window. They were the best looking short ribs I have ever laid eye on! They were rich, vibrant red with nice marbles. At $9.99 per pound, it was a bit steep for me. However, it’s not unusual to see that kind of price with the current cattle shortage. The ongoing drought and high demand for beef have skyrocketed cattle prices in recent years. So I stood there for a while, contemplating if I should get them. Other customers came and left. After 10 minutes of internal debate and nudging from Vu, I caved in. My justification? We eat short ribs once a month. Sometimes as long as once every two months. So it was a TREAT! I was ready to make our favorite short rib recipe! 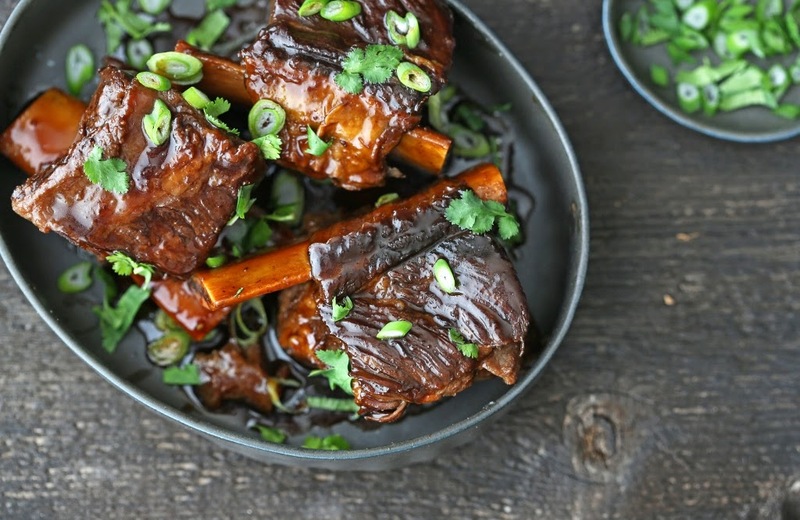 Asian braised short ribs. The meat is seared and then slow cooked in a Dutch oven in a bath of spices, soy sauce, and rice wine until the meat becomes tender and falls off the bone. Both Betsy and Vu were camping in the kitchen, tantalized by the lovely aroma of spices and developing broth. After two long hours, we were able to enjoy the tender short ribs, falling easily at the pull of our fork. Rice and steamed asparagus were our accompaniments. Nothing fancy. So simple yet satisfying! 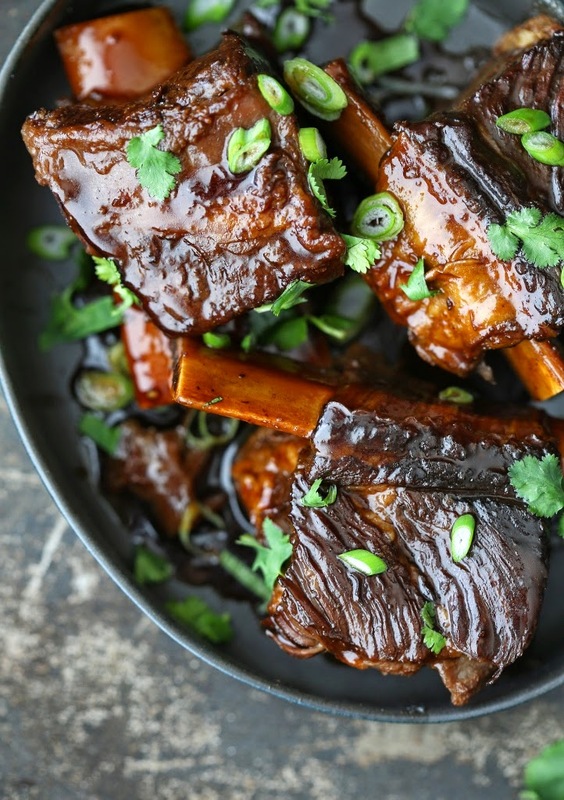 This is definitely our favorite way of cooking short ribs. I would love to hear about your favorite short ribs recipe. 2. Place ginger, cinnamon sticks, and star anise on a baking tray and bake in the oven for 10 minutes. 3. In a mixing bowl, whisk together soy sauce, rice wine, hoisin sauce, brown sugar, and water until evenly combined. Set aside. 4. Season short ribs with salt and pepper. 5. Place a Dutch oven on the stove over medium-high heat and add oil. 6. Add garlic, lemongrass, ginger, cinnamon, and star anise to the Dutch oven and cook, stirring until fragrant, about 5 minutes. Remove everything and set aside. 7. Working in batches, add the short ribs and sear until all sides are browned. Remove ribs to a plate and set aside. 8. Return garlic, lemongrass, ginger, and spices to the Dutch oven. 9. Stir in combined sauce of soy sauce, rice wine, hoisin sauce, sugar, and water and bring to a boil. 10. Return ribs to pan and bring to a simmer for about 10 minutes. 11. Cover and transfer to oven to cook, turning occasionally, until meat pulls easily with your fork, about 2 hours. 12. Transfer the ribs to a platter and cover to keep warm. 13. For the glaze, remove 1 cup of braising liquid and skim off as much fat as possible from the surface. 14. Place the braising liquid in a sauce pan and cook on high heat until syrupy, about 15 minutes. 15. Divide the ribs among individual plates with rice, spoon the glaze over the ribs, garnish with green onion and cilantro. Serve right away.